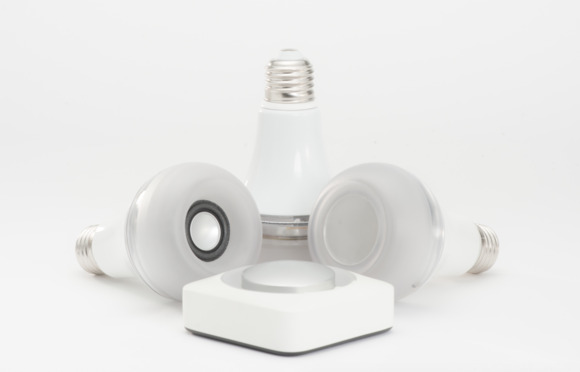 Home automation gets ultra simple with this smart light bulb that also streams music. The connected home sounds like a pie-in-the-sky concept to apartment renters who can’t exactly invest in expensive hardware and rewire a place just to pack up and move after a year or two. But there are little ways to bring home automation into your temporary dwelling without huge costs up-front. Take Twist, a new LED light bulb that turns your lamp into a Jambox-style speaker using just AirPlay. Twist is one of the simplest home automation products I’ve ever seen demoed. There’s no installation. There’s no hub. “You have a lamp? Now you have a speaker inside that lamp,” Springer said. If you want a smart home-audio solution that requires minimal effort, Twist might be the answer. Twist preorders begin Wednesday. For $249, you’ll get a bundle that includes three bulbs, one of which is also a speaker, and a dimmer to control them. The final product ships in early 2016. Each bundle is designed to completely outfit a room, typically a kitchen or living room—a space where you’d want both good light and good music. The three LED bulbs can be controlled with a dimmer or the Twist app, and automatically adjust throughout the day from a cool blue to a warm yellow to replicate the natural progression of daylight. The AirPlay-integrated speaker/light streams music over Wi-Fi from any Apple device. As long as you’re connected to your wireless network, you can play music. The speaker quality is similar to Jawbone’s Jambox, Springer said. Springer once worked for home automation giant Crestron Electronics, where he often took home really expensive hardware that “took up tons of space” in his Brooklyn apartment, he said. Twist is designed for urban renters who want to see what the connected home is all about without all the fuss. Astro isn’t exactly reinventing the wheel here—Twist is far from the first light-bulb speaker, but Springer believes his product is the best one. And for AirPlay fans, it might be the easiest solution.